Historic Scotland has pledged a contribution of £460,000 towards the restoration of Brough Lodge, the A-listed house in Fetlar. The offer of grant, warmly welcomed by the Brough Lodge Trust, will meet 11.5% of the total cost, which is estimated at £4m. The Brough Lodge Trust has always intended that the old house would be used as the venue for residential workshops, attracting visitors from around the world to learn about Shetland music, textiles, archaeology and wildlife. 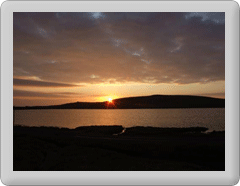 The Trust’s business plan has shown that the income generated from accommodation and other services would create direct employment in Fetlar and produce wider economic benefits for the North Isles and the rest of Shetland. With the first major phase of restoration complete, the Trust has been considering how these benefits can be maximised. Following discussions during August with people involved in textiles, Trustees concluded that a priority should be support for traditional knitting skills. The Trust intends to develop a programme aimed at teaching hand knitting to school children and a local task force has begun to consider how that can best be done. It is likely that several pilot projects will be carried out to help determine the right approach. Once Brough Lodge is operational, profits will be used to support the programme. Meanwhile, the Brough Lodge Trust has received overwhelming support from the Fetlar community. Other local organisations – including Shetland Charitable Trust and Shetland Amenity Trust – have indicated that, whilst they aren’t able to commit funds, they back the project. Pierre Cambillard added that the Brough Lodge Trust is “hugely impressed” with the restoration work that has been undertaken by the Shetland Amenity Trust’s Architectural Heritage Team. As well as installing new roofs and ensuring that the building is wind- and watertight, the team has substantially restored the original appearance of the main building. Contributions will also be welcome from those who may wish to support the pilot hand-knitting projects. Any donations may be addressed to Brough Lodge Trust, c/o Paul Rutherford, St Olaf’s Hall , Church Road, Lerwick ZE1 OFD. A Gift Aid form is available on request and any donation will be acknowledged with a receipt. Full details of the project are available at www.broughlodge.org.